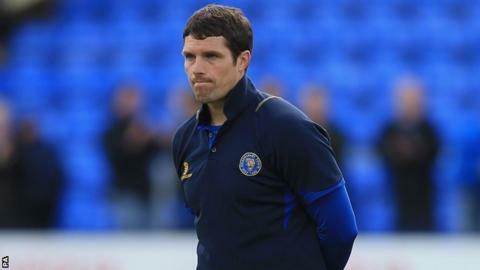 Mike Jackson admits that it was hard to take when Shrewsbury Town went down to League Two in May, costing the then interim manager his chance of getting the job on a more permanent basis. But Jackson could not be more proud of the way the club have rallied this season under new manager Micky Mellon. With Jackson kept on as his number two, Mellon's men are top of the table. "It's given me a chance to be part of the process of fixing it," Jackson told BBC Radio Shropshire. "We've worked a lot on the mental side, but a lot of the credit has to go to Micky. The place was upside down with people leaving. "But he's embraced the staff that were here, trusted people to do jobs and everyone's bought into it. Slowly but surely, it's built and people throughout the whole community are feeling part of something." Shrewsbury begin 2015 top of League Two, level on points with Wycombe. Their success has been based on their form at the Greenhous Meadow, where they have won 10 and drawn two of their 12 League Two matches, conceding just three goals. Shrewsbury go into 2015 top of League Two and in contention for promotion, whereas a year ago the club were in a bit of a state as they approached the end of an increasingly disillusioned Graham Turner's second stint at the helm. Seemingly, the only players they could attract to the Greenhous Meadow were short-term loan signings, 20 of them last season alone. Jackson could only follow the same loan signing route, managing only three wins from his 19 matches in charge after taking over in late January, as Town were relegated from League One. But he saw enough potential within the club to want to be part of the reconstruction, fuelled by the financially regenerated club's 17 new summer signings, and it has not dimmed the 41-year-old's long-term managerial aspirations. "I'm learning all the time," insisted Jackson, a former Crewe, Bury, Preston, Tranmere and Blackpool defender. "I've learnt a lot from the last year and I will continue to learn. The whole situation, dealing with players, tactics, games - no course can prepare you for that. "It was really hard last season. It had never happened to me before but I've had the chance to redeem it. I've been in promoted teams before and I know what that feels like. We've worked with the players on what is achievable. You just want to win things in this game. "The last couple of years, we've just taken part and not really strived for anything. That gives you your edge. You need something to go for, and getting back to League One has always been my goal."